We wanted to take a moment and say a big thank you to everyone for attending another fantastic Crabfest at Calapooia Brewing! Calapooia Brewing really values hosting this special event, and we were so happy to see so how many people came out to support a good cause, all while having a great time and seeing all that we have to offer. 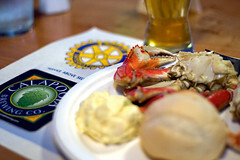 We have just released our latest batch of Pilsner, which was a great pairing with the seafood! Many thanks to the Rotary and all their volunteers who helped keep this event running smoothly. And a special thanks to our crew: Steve, Kary, Summer, Deena, Matt, and Zach — Not to mention Paul, our brewpub manager, for coordinating one of our biggest events of the year. And one last shout out to our Facilities Manager and Environmental Advocate, Nick Hawley. Nick encouraged the Rotary Club and Calapooia Brewing to think of ways we could be mindful of our environment when hosting an event like this. The Rotary club really came through with corn based plates, flatware, and cups, which allowed for composting of nearly all of the garbage! Calapooia Brewing is proud to be innovator in green recycling and we thank Nick for his efforts! We had a great time this year and hope next year’s event is even bigger as we expand our warehouse seating. Below are a few pictures I snapped while enjoying some crab last weekend. If you have pictures you would like to share, please email me and I’ll get your pictures on our website! And if you have an event you need to host for 20 people, or 350, we hope you’ll consider your next event at Calapooia Brewing!